This is part of the tenth round of airports issued by Alpha India Group. AIG Ground creates high quality Afcads for both FS2004 and for FSX default and add on scenery airports. Airports are created drawing on the best available resources and aim to simulate the real world airport as closely as possible but also to ensure good levels of traffic with realistic parking and good flow of traffic around the airport. By Paul Harrison and Alpha India Group. View of Hong Kong International Airport. Hong Kong (Chek Lap Kok) International Airport is the main airport serving the island of Hong Kong, replacing the famous Kai Tak airport in 1998. It is a major transport hub in Asia, proving a gateway into mainland China from Europe and the Americas. In 2009 it was the 13th busiest airport in the world with passenger numbers exceeding 45.6 million and is the second busiest cargo airport in the world, handling in excess of 3.4 million tons of cargo in the same year. Hong Kong International is the principal hub of Cathay Pacific Airways, Dragonair, Hong Kong Express Airways and Hong Kong Airlines. Air New Zealand, Qantas and Virgin Atlantic all use the airport as a stopover point for flights on the "Kangaroo Route" between Australasia and Europe with many other international airlines using the airport as a stopover or entry point to mainland China and southeast Asia. In all, Hong Kong International handles flights from approximately 90 different airlines with over 150 destinations worldwide. The airport has significant cargo facilities, serving around 60 different cargo airlines on a regular basis. Hong Kong International has minimal general aviation facilities, primarily servicing business jets through the Hong Kong Business Aviation Centre (BAC). The airport also has a large maintenance area with hangar and apron facilities for more than a dozen wide and narrow body aircraft simultaneously. Hong Kong International airport is also the home of the Government Flying Service, providing search and rescure, medical evacuation, police aerial support and other services for the Hong Kong government. In 2009, the Government Flying Service had 3 fixed wing aircraft and 7 helicopters based at this facility. Adjusted taxiways to improve traffic flow around the airport. Added airline specific parking spaces to passenger terminals, cargo and maintenance areas. VHHH does not have specific airline gate assignments in reality, however airlines do tend to use the same gates regularly and this has been represented as best as possible. Added parking at maintenance area. Added parking at the cargo areas. Note that cargo gates C1 through C5 are not modeled in the ImagineSim scenery but have been included to allow the airport to handle a larger volume of cargo aircraft. Added parking at the Hong Kong Business Aviation Centre. This area is not accurately modeled in the ImagineSim scenery and it has not been possible to add a realistic number of general aviation parking spots. Added parking at the Government Flying Service area including coded parking for their fixed wing aircraft. Parking has also been added for visiting military transports. Corrected airport altitude to prevent ground texture bleed though. To Mariano Bonaccorso for his detailed knowledge of operations at VHHH which proved invaluable in assigning airline appropriate parking spots. The genesis for this airport design is Mariano's excellent FS9 version, ade9_vhhh_imaginesim_mcb.zip. ADE (Airport Design Editor) by Jon Masterson is an invaluable freeware utility for developing Afcads and the latest version - 1.47 - is significantly advanced with the addition of the graphic Approach code editor, written by Jim Vile. My thanks to both Jim and Jon for all their help and support on this and all AIG projects. This parking design is intended to be used with Imagine Simulation's FSX version of VHHH - it will not work with the default FSX VHHH airport. Some general aviation packages (including the default FSX GA traffic) have single engine light aircraft using VHHH which is prototypically unrealistic. Such aircraft would typically utilize Shek Kong Airfield (VHSK), located in Hong Kong's New Territories, and it is recommended that flightplans sending light aircraft to VHHH be edited, replacing VHHH with VHSK. The AI Flight Planner utility provides a simple way to achieve this substitution. ImagineSim chose not to implement animated jetways in their VHHH scenery. It has not been possible to remedy this situation in this airport design as it is a fundamental limitation in the scenery. If you'd like animated jetways at VHHH, email ImagineSim and let them know! The excellent ground traffic provided by ImagineSim in their VHHH scenery does not service the cargo, general aviation, military or maintenance areas. It was not possible to add a default vehicle network to these areas without compromising the functionality of the whole airport. Some AI aircraft have incorrect wingspan values. FSX uses these values to determine which parking spots are used and so if an AI aircraft has its wingspan set too low, it may park in a spot which is too small. Where possible, space has been left around parking spots so that this does not cause problems, however in some areas (notably the general aviation parking) this was not possible. It is strongly recommended that you use a utility (such as AI Aircraft Editor, supplied with ADE) to correct the wing span values of AI aircraft to avoid this problem. Remove any existing third-party VHHH AFD/Afcad file in your FSX installation (check for files including VHHH in the filename in the "Addon Scenery\Scenery" folder). Rename or delete the ImagineSim parking file. This will be named either SG_AFX_VHHH_with_imaginesim_aircraft.bgl or SG_AFX_VHHH_without_imaginesim_aircraft.bgl and is located in the "Imagine Simulation\VHHH Hong Kong\scenery" folder. DO NOT DELETE the files located in the "Imagine Simulation\VHHH Hong Kong\afcads" folder as these can be used to restore the ImagineSim parking if you wish. Rename the file VHHH_ADEX_IML.BGL (changing the filename to VHHH_ADEX_IML.BGL.bak is recommended). This file is located in the "Imagine Simulation\VHHH Hong Kong\scenery" folder. This step is essential - failure to rename this file will create a conflict with the replacement parking files and will cause FSX to crash when selecting VHHH. Deletion of this file is not recommended as it will prevent uninstallation of this parking design. Place the file AIG_VHHH_ADEX_PH_ImagingSim.BGL in your FSX "Imagine Simulation\VHHH Hong Kong\scenery" folder. 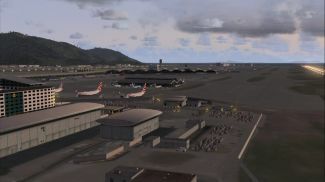 Place the file AIG_VHHH_ADEX_PH_ImagingSim_ALT.BGL in your FSX "Scenery\World\Scenery" folder (this file adjusts the airport's altitude slightly to eliminate ground texture bleed problems). Start FSX, select VHHH and enjoy! Delete the file AIG_VHHH_ADEX_PH_ImagingSim.BGL from your FSX "Imagine Simulation\VHHH Hong Kong\scenery" folder. Delete the file AIG_VHHH_ADEX_PH_ImagingSim_ALT.BGL from your FSX "Scenery\World\Scenery" folder. Rename or replace the ImageineSim parking file in the "Imagine Simulation\VHHH Hong Kong\scenery". The originals are located in the "Imagine Simulation\VHHH Hong Kong\afcads" folder, and one of these (not both) can be copied back to the "Imagine Simulation\VHHH Hong Kong\scenery" if you deleted it when you installed this airport design. Rename the file VHHH_ADEX_IML.BGL located in the "Imagine Simulation\VHHH Hong Kong\scenery" folder from whatever you changed it to during installation. The archive aig_vhhh_hong_kong_fsx_imaginesim.zip has 13 files and directories contained within it. I’ve always been a big fan of the FSX/FS2004 packages released by Alpha India Group, as they tend to get it just right with the details. I’ve forensically investigated their packages with the real thing and always been unable to come back with any legitimate complaints, so I was very excited to try out this tenth release, recreating the Hong Kong International Airport. I’ve actually had the pleasure of using this aircraft in the last few years, so I was very impressed to see that someone had taken the time to create it and was anxious to see what job they had managed to do. Well, the airport itself is hugely impressive and is a big improvement over the original that sat here. It’s been very easy to fly around in for a start, with no real lag or delay in performance even on a choppy laptop that isn’t the best you’ll find. Likewise, the accuracy and attention is brilliant, really capturing all of those small details from the layout of the buildings to the kind of textures used. Rather than just being a close approximation of the real thing, this manages to pack in extras like the taxiways to improve the overall performance thanks to freeing up traffic. This is just one aspect of the design, though; the elements may look brilliant, but it’s the thinking behind them that was so impressive to me. The airline parking has been improved, as well, so that it feels far more like the real life airport style and has that bustling, live nature to it without absolutely tanking the quality of the performance that you are getting. By doing this, you’ll get to see big changes in things like the approach codes and the taxiway alignments; both of these problems are fairly major in the old model so it makes a big difference to the whole airport. By improving performance you will have much more fun as you’ll now get to fly around an airport that actually accurately depicts the piece that it’s supposed to be. You’ll also get to enjoy the depth and detail that this airport manages to capture in comparison to the world around it, with the extra parking ensuring that everything from larger volume of cargo airport and transport can arrive to military transports. Altitude has changed quite impressively, too, which must have been a nightmare to do! This ensures that the world looks right and that the textures all stay in place, only adding to the already excessive visual appeal that this brings to the table. If you want to understand why this airport is such a beloved location, then fire it up today. It’s well worth your time and the fact that it gives you access to some brilliant features such as new and exciting designs should only help to solidify the fact that this is right up there with the rest of the AIG projects. From installation to actual usage in the long-term, this package is an excellent find that I would happily recommend you try out. This scenery is incredible and goes extremely well with Fly Tampa's Hong Kong Kai tak which I also have. (have to practice those infamous RWY 13 thrill rides every now and then LOL).